Acquired: IP 2014, Kemah Houston Texans Fan Fest. 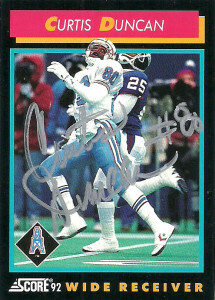 After losing all of the other cards to the TTM gods back in 2013 of JJ Moses, I quickly scrambled to get some cards together to have him sign at that year’s Fan Fest event. 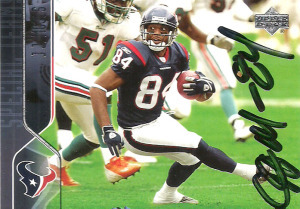 Unfortunately this Upper Deck 2003 missed the cut, so once I got a copy I held onto it just in case I’d get the chance to see JJ again. I decided at the last second again to make the yearly pilgrimage to Houston for the 2014 Fan Fest. I wasn’t really prepared for the journey there. The weather was some of the worst I had encountered in quite a while, and I got lost. Luckily I pulled out my ancient GPS – that hadn’t ever been updated (2007) and limped into Kemah with a new umbrella in hand. The remnants of a tropical storm were dumping in waves over the Houston area, but thankfully this kept the event low key. I quickly found parking in the covered lot and was directed to the backup makeup location where the players and cheerleaders were going to sign in tents. 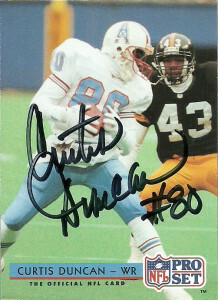 The players were forgivingly late, but once they got the procession going they quickly signed everything in their way. When I got up to the front, I was really surprised that JJ remembered me. He was very kind, and let me know that he had read and liked my previous post on him! 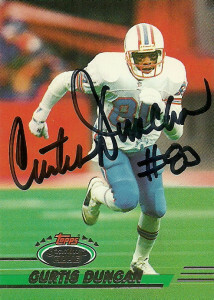 I hoped at a later date to do a custom of JJ from his days with the Claymores, but I could not find an image that was large enough (that wouldn’t pixelate badly) to use. I reached out to JJ to see if he had anything through his Facebook page, but as of the publishing of this article, did not hear back from him. 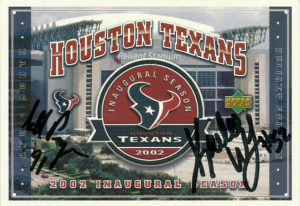 JJ remains active in the local Houston area for events, charities, and as a Houston Texans’ Ambassador. 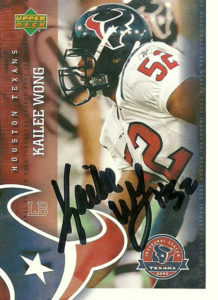 As I slowly make my way through the team set, I had targeted Kailee Wong when I had heard he was a member of the Texans’ Ambassador Program. It’s usually a shot in the dark showing up at the events so even though I had gotten teammate Seth Payne sometime ago, it was still worth it to go to Katy to nab Kailee on these cards. 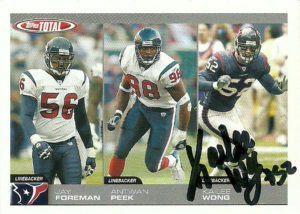 Like most former Texans, Wong was impressed with his Houston Texans Upper Deck card. 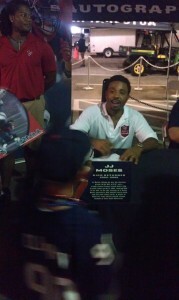 While signing he asked how many I had in my collection- a first in all my in person collecting. He was very impressed that I had 2,500 in the collection. Wong recently left the company he was working for and told me life was treating him well. Kailee was originally a 2nd round draft choice of the Minnesota Vikings in 1999 from Stanford. 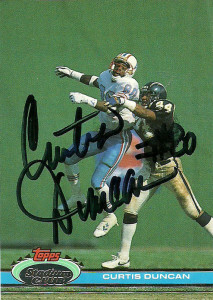 He tallied 271 tackles, 7.5 sacks, and 5 interceptions for 55 yards and a TD. Most of his stats came in his final two seasons with the Vikings, when he was slotted at middle linebacker. at linebacker. While with the Texans, Wong put up a respectable stat line at primarily left outside linebacker. 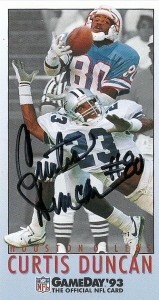 Over his career there he tallied 164 tackles and 15 sacks. 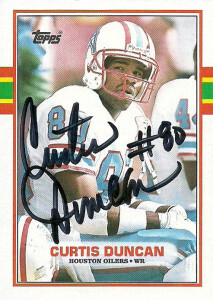 He was the career leader in sacks for the franchise at the time of his retirement. Highly effective in pass coverage, Wong blanketed defenders to the tune of 25 combined pass deflections in 2003 and 2004. In the end injuries and age caught up to Wong in 2007. While the flame continued to burn bright for Wong, the Texans wanted to get younger and asked Kailee to accept a backup role and mentor the linebacker corps. He asked for and was granted his release instead.